After a tiring day, we let ourselves sleep a bit more on the third day in Quebec City. 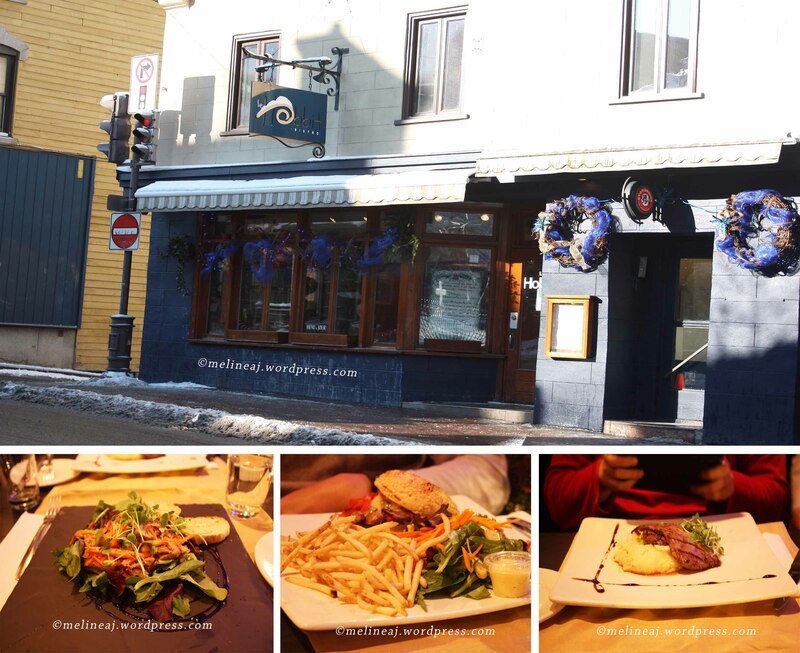 After having breakfast, we were ready to explore the other side of Rue Saint-Jean, the area further from Old Quebec. From the research I did, there is a Chocolate museum somewhere along this street, so that was our goal. Passing the St. Mathew Cemetry, we finally found Erico Chocolate Museum. We came just in time the store to open. 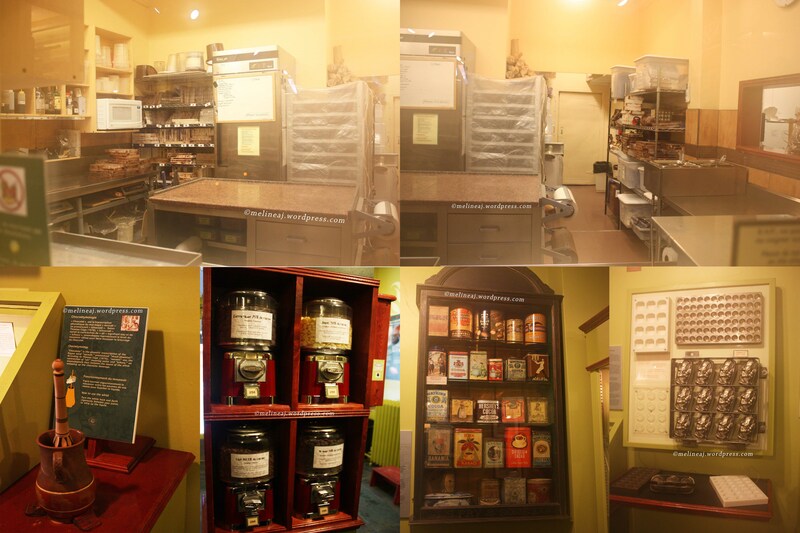 This chocolate museum & store tucked between shops and restaurants that we almost missed it. Thanks to the iPhone app (Vive Cite) that buzzed to notify that we were near. 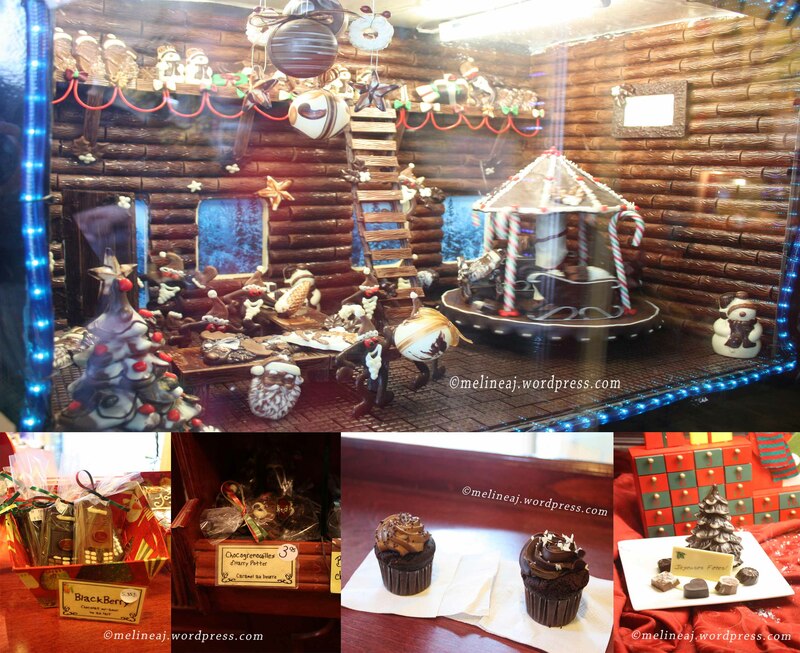 They had a Christmas display in front of the store made of chocolate. 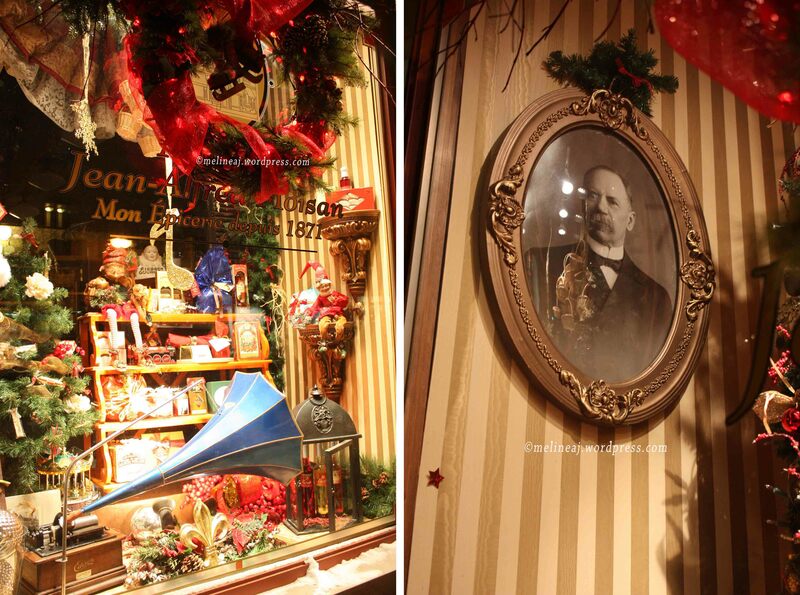 To the left of the store, there was a mini chocolate museum. It shows the history of chocolate, the ancient tools to make it, and some of the modern moulds for chocolate production. There was a big window where we could see the kitchen. When we were there, nobody was in the kitchen – maybe we were too early 😛 They also had some dispensers containing chocolate from different countries. My fiance tried the 100% cacao and it was bitter! Oddly enough, he liked it hahhaha… After browsing the museum, we headed to the store. They sold some cute shaped chocolate, such as iPod, Blackberry, guitar, and violin. We bought some chocolate as gifts for our friends and we also bought 2 chocolate cupcakes. The cupcakes were very dense chocolate cake and the frosting was good too! What a great way to start our day 🙂 There were some seats in the front of museum, so we enjoyed our cupcake while planning our next destination. We tried to find JA Moisan Epicerie along this road but it seemed that we passed it. J.A. Moisan Epicerie is claimed as the oldest supermarket in North America. Oh well… We found it later at night when it already closed 😦 We also noticed a restaurant called Le Hobbit. The name sounds like Lord of the Rings character and after a bit research, it’s actually a pretty good restaurant, so we decided the we would have dinner there. 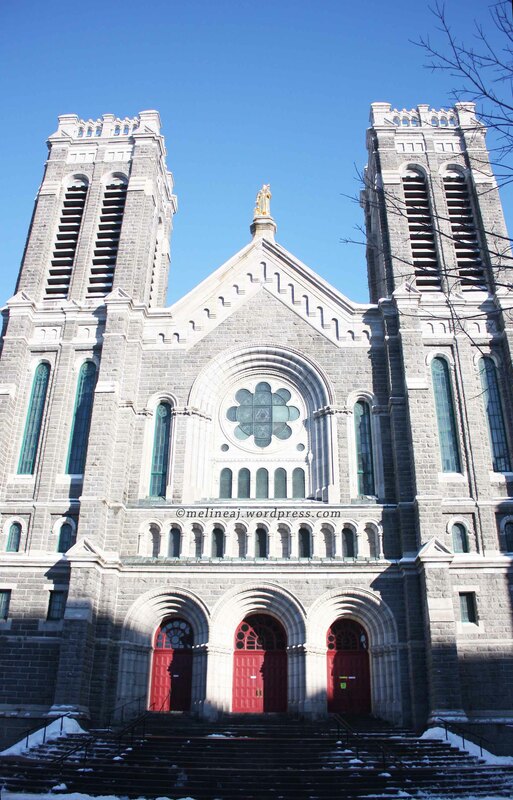 With enough sugar in our system, we were in a journey to find St. Roch church which was claimed as one of the beautiful churches in Quebec City. We walked a bit farther down Rue Saint-Jean and found Presbytère Saint-Jean-Baptiste church instead. It has a gold Christ statue in the front. Since it was closed, we only took some pictures at the front. 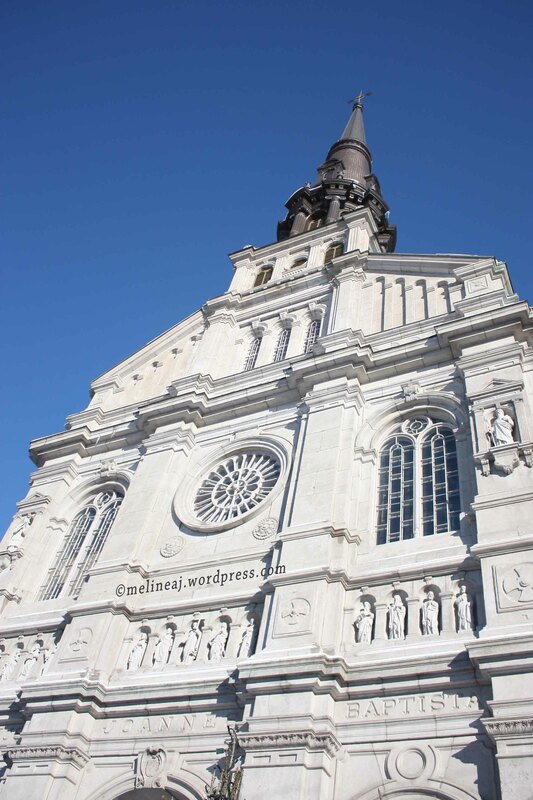 We walked couple more blocks along Rue Saint-Jean, but we couldn’t find the Saint-Roch Church, so my fiance used his iPad & Google Map to find it. Apparently, we were pretty far from the church, well iPhone app itself couldn’t help if I couldn’t follow direction of the map hahaha…. Despite going back toward the beginning of the street, we braved ourselves to walk through small alleys. This was the beginning of the boots disaster. The road was so wet from slushy snow and the cold water was slowly seeping through my boots 😦 But then, we arrived at end of Rue Sainte Claire and Rue Saint Real where the Escalier de Faubourg is. This 99 steps stairs connects the upper and lower town overlooking Jardin de Saint-Roch (a beautiful garden with fountain in the summer but it was frozen during winter). 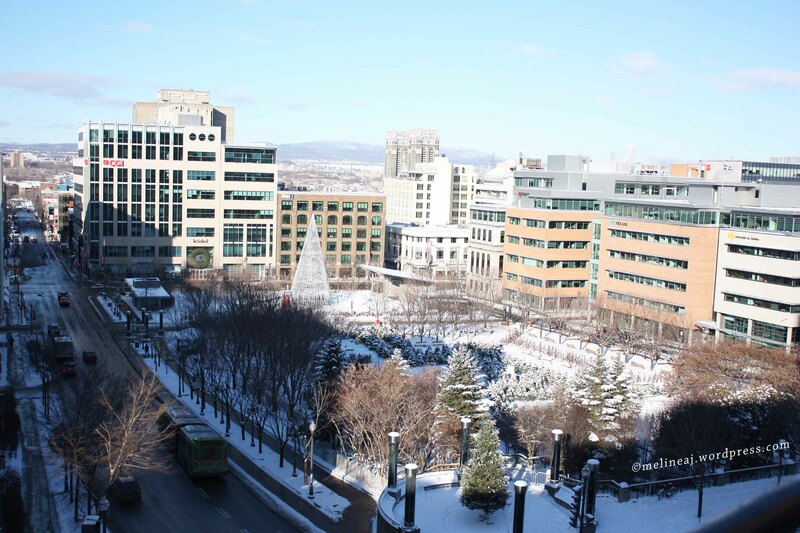 Around this garden, there are some tall office buildings and Institut National De La Recherche Scientifique Univeristy. We walked along Rue de la Couronne until we reached Rue Saint-Joseph. There were boutiques and shops around this area. We could see the Eglise Saint-Roch church from a far but then again when we arrived, the church was closed *bummer! 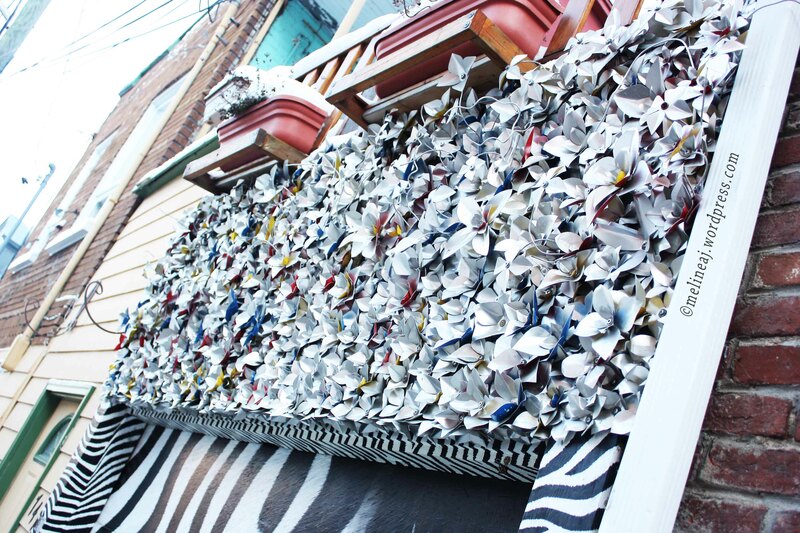 * Since it was a pretty busy street, it was pretty hard to take picture from a far to show the whole building. So, all attractions were checked! It was time for me for shopping! And did I mention that it was BOXING DAY! YAY! Across the church, I saw Urban Outfitter store was having big sale, I went inside and bought a leather jacket that was previously $80 for only $30!!! What a steal! There were couple more stores that I entered like Mango (YES! Quebec City has Mango clothing store! ), Benjo (kid clothing store), Hugo, The Source, etc. 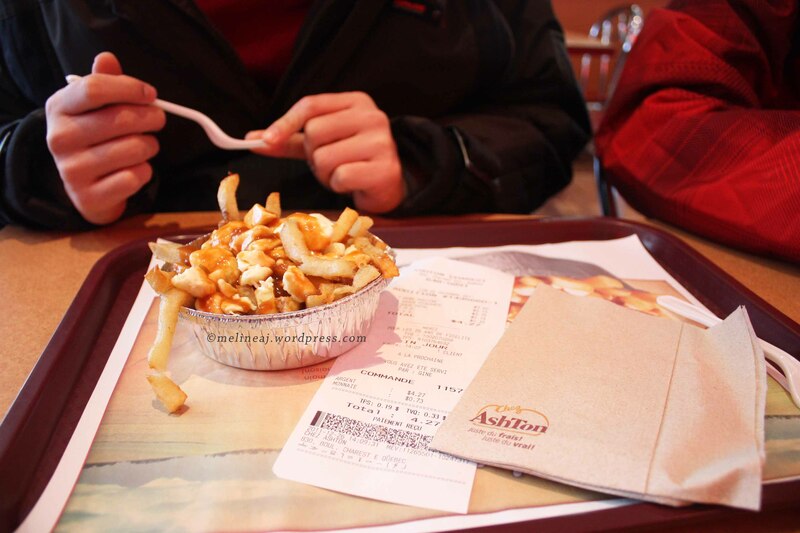 We then saw Ashton, a poutine fast food restaurant and we HAD to try it! The poutine was just okay (if you’re unfamiliar with poutine, it’s a french fries with cheese curd & gravy). After more researches, we decided that it was time for us to shop a bit more! YAY! My fiance looked for some malls nearby called Laurier Quebec and Place Ste-Foy. We took bus #800 to get there and it took only about 20 minutes. The bus trip passed through Laval Univeristy complex. The first mall that we went was Laurier. It was a big mall! I just went directly to a shoe store to buy new boots and bye bye my grumpiness 🙂 We browsed the mall until it closed, well not that late since the mall closed at 5 pm. We went back to our hotel to freshen up a bit and put down our shopping bags. Then, we walked to Le Hobbit to have a nice dinner. I ordered a duck confit salad with sweet vinaigrette, my brother ordered an elk burger, and my fiancee ordered a venison steak. The foods were good! My duck confit salad was super delicious! The elk burger and venison steak were good too. We walked toward Place D’Youville again since my brother hadn’t been there the night before. This time, there were a lot of people ice skating and there was live music too. We looked for a crepe restaurant since I was desperately in need for a sweet dessert. We went to Au Petit Coin Breton on Rue Saint-Jean (the road along Paillard and Casse Crepe Breton – see my post for day 2). This small restaurant has a unique wooden rustic interior decoration. Even one of the server – or maybe the owner – wore an uniform that was the same as their logo – see for yourself in the picture below. We ordered 2 sweet crepes: mapple butter & ice cream and sugar & lemon. The mapple butter crepe was our favourite! It was just enough sweetness when you combine it with the ice cream. I also liked the sugar & lemon crepe. It’s a really good palate cleanser after eating a high fat food like duck confit or steak. With full stomach, we went back to the hotel and I had a chance to swim for a bit under the snow! We packed our bags and got ready for a bus trip to Montreal the next day. 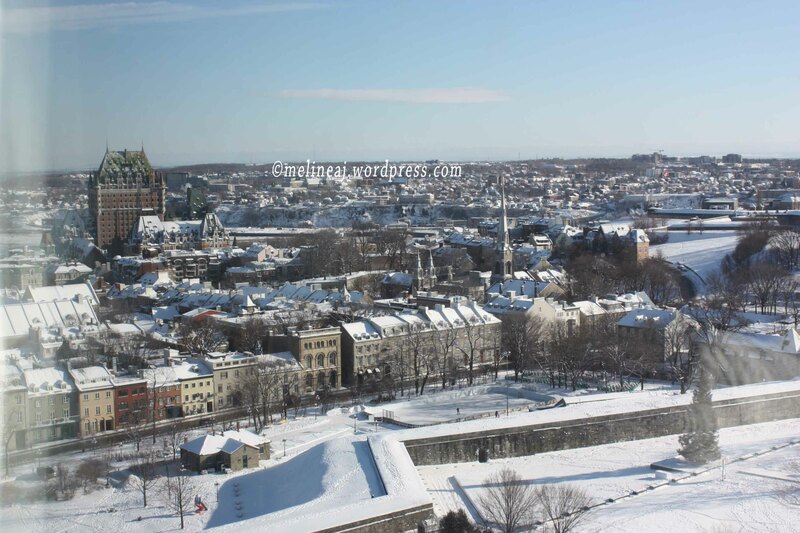 Au revoir, Quebec City!